- (or even less), metal items. Technical Specification:- 1. Sensitivity : Detects 0.1 gm of 6mm 2. Supply : 9V DC 3. Input : 230V, 50 Hz (for Charging) 4. Colour : Black 5. Rated Current : 12.5 mAmp (max) 6. Power Consumption: 110 mW (max) Weight : 275 gm (Approx). Features: 1. Ultra High Sensitivity 2. Detects Ferrous & Non Ferrous Metals 3. 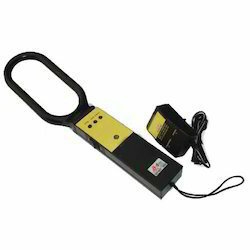 In order to keep pace with never ending demands of clients, our company offers Hand Held Metal Detector. - Detects ferrous and nonferrous metals. - Current Consumption : Less than 3mA. minute quantities of gold, silver, platinum, brass, copper & stainless steel are detected effectively. ultra high sensitivity & stability. 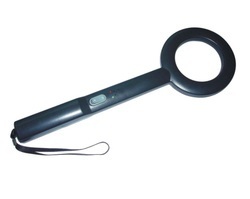 operates on disposable dry battery or on rechargeable battery. Fully Automatic self adjusting circuits Inbuilt battery charger "Variable Audio gives an idea of quantity of metal detection. Audio / Visual indication for metal detection.High resistant ABS molded body.High sensitivity for ferrous, non-ferrous metal & its alloys, even concealed in ferrite.Will not affect “Cardiac pacemaker & magnetic tapes / film.